HEX: Shards of Fate is an ambitious TCG project brought to us by Hex Entertainment, which is partnered with Cryptozoic Entertainment, producers of a myriad of TCGs and boardgames in the past. HEX will be a fully digital TCG, which is why Cryptozoic wanted to get the full effect out of the game and has plans to turn it into something resembling an MMO – a TCGMMO to be exact. 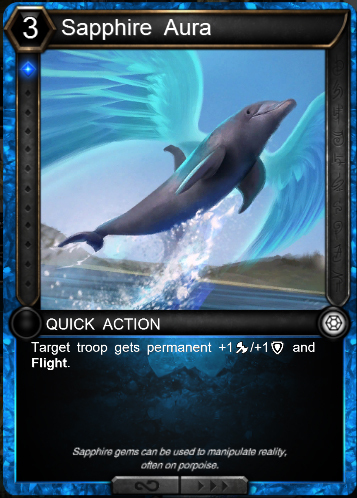 The game will not only have the features typical of TCGs, such as battling other players, collectability, and beautiful artwork, it will also have features that are unique to digital TCGs, such as PVE content, cards that can be transformed, or the ability to carry hundreds of cards with you anywhere you have access to wifi. The game had a successful Kickstarter in June of last year, receiving $2,200,000 of their $300,000 goal. 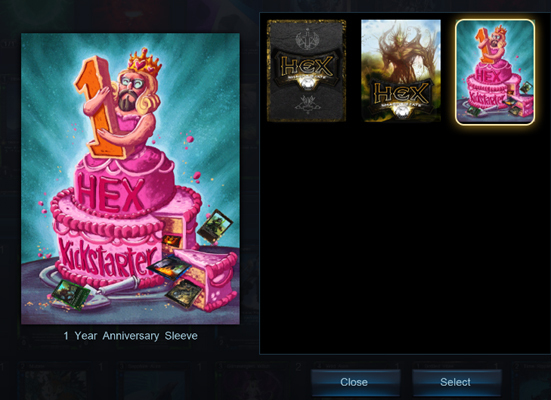 HEX has all its cards lined up to be an extremely successful example of what is sure to become the new genre of TCGMMO. HEX is a unique game, with all the features that are planned. I’ve had the luck of being able to participate in the game’s beta since we met with the team at E3, where I got some experience with the game. However, this experience is only related to the traditional TCG portions of the game – starter decks, booster packs, drafts, regular play, and some play against AI opponents. A lot of the most anticipated features aren’t yet available in the game. So, a majority of what I speak of in this article will be related to those portions of the game available in the beta. The game is played very similar to other TCGs. In fact, I would say the game is played pretty similar to Magic the Gathering and Hearthstone. Cards have their resource cost to enter play, and there’s a couple of different types of actions you can take during your turn. Your “troops” are responsible for doing a majority of the fighting and damage dealing. There are also cards called “Artifacts” that have some unique abilities and are neutral in terms of element/color/type. There are event “Constants” as well to further mix up your tactics with. Each deck is assigned a champion, as well, which will have its own unique abilities that grow with your account. If you’ve played a TCG, especially Magic the Gathering and perhaps Hearthstone, you’re going to find HEX quite easy to get into. At least in the battle portion of the game. The flow of the battle is pretty simple – draw, play, attack, end turn. Of course, when being attacked you have the option to defend with any troops you have in play that aren’t exhausted from your previous turn. 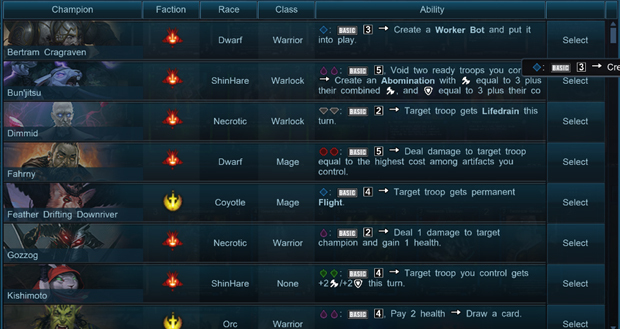 Each card has an over-all cost, as well as a specific requirement of a certain type of resource card. For example, a card may take five resources, and two of them need to be sapphire while it doesn’t matter what the other three are. The goal of the game is to defeat the other player’s champion. To do this, you’ll either need to find a method of bypassing the other player’s troops, or defeat them in order to clear the way so that your damage can reach the champion. 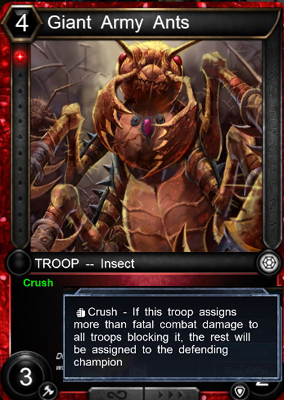 There are a few ways of doing this, such as a troop with the flying modifier – which can only be blocked by another flier, or perhaps the crush modifier – which is extremely good with high damage troops, as it’ll cause any left-over damage you have after killing a troop to go straight to the opposing champion. Each champion has 20 HP plus a special ability that can be activated once you have a certain amount of resources. Generally, this is usually spawning a special troop but not always. The abilities can be almost anything, from damaging the enemy champion to healing your own. Each champion also has a certain color alignment plus a faction alignment. However, there’s really nothing stopping you from attaching a champion to your deck that requires a type of resource that isn’t in the deck. Not that you would want to do that. Now that you have a basic idea of the various gameplay elements, let’s talk about something important. Such as the graphics. 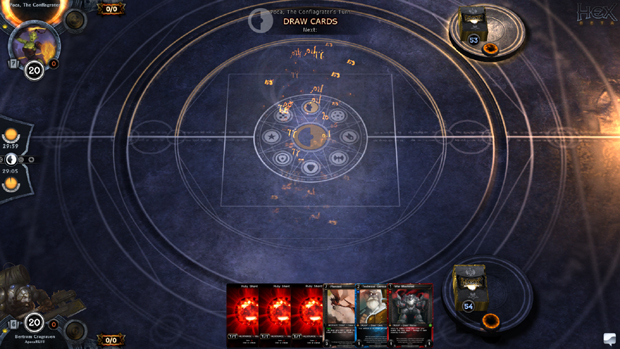 By the screenshots I’ve shown already, you’ve probably noticed the card layout. Top left corner is the cost, and under that is the specific requirements of color type. 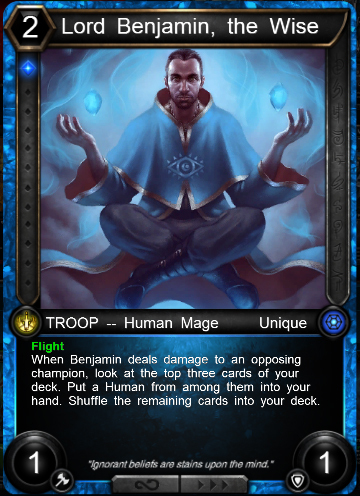 Under the artwork of the card is where special information relating to the card (such as any modifiers like flight, crush, or lifesteal) and often times a small quote or back-story relating to the card’s lore. Bottom left is attack score, and bottom right is the defense score. You may have also noticed that the cards are designed in a similar fashion to Magic the Gathering cards. Not quite the same, but similar elements. This is one of the reasons that Hex/Cryptozoic Entertainment are now being sued by Wizards of the Coasts. Most people think that Hex will not be affected by the suit, including myself, so there’s not much to worry about. However, if you’re interested in learning more about it, here’s a link. The Artwork in the game is fantastic. It has a realistic style to it, but the themes are mostly fantasy. As a steampunk fan, the dwarf and artifact cards are usually my favorite, due to the steampunk technology apparent in the artwork for those cards. Not all of it is serious, though. 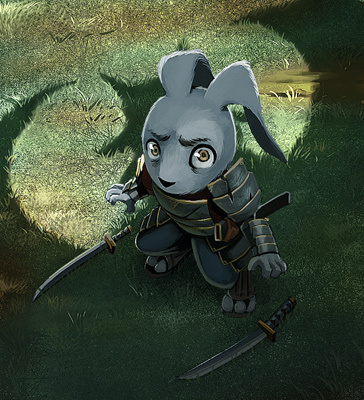 Especially when it comes to the Shin’hare cards, which are a bunch of Bushido themed zerging rabbits. Overall, the quality of the artwork is some of the best I’ve seen in a TCG. Last, I want to close up this portion of the article by talking about the graphics in general. The UI and play area in particular. When I first heard about HEX, the game board/play area is one of the things that caught my eye the most. It has a very arcane feeling to it, which is something I like. The UI is also sleek, for the most part. It tries to give you the information that you need, while leaving as much space as possible for the cards so that things won’t feel cramped. I’m quite pleased with the UI and play area. There isn’t much customization in the game, yet. Later on there should be a lot of it. 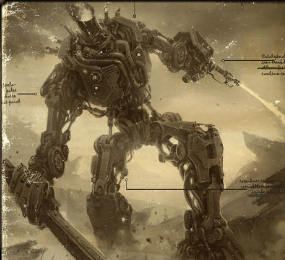 For example, from what I’ve seen there are plans to allow you to customize champions by equipping them with gear. And some cards are socket-able, which I believe means you can attach gems to them for bonus enhancements. However, neither of those are functional. To be honest, about the only customization currently available in the game is when it comes to building your deck and choosing a deck sleeve. But there are a lot of planned customization features, so that’s plenty to look forward to. Something that was added just the other day is the Auction House. It wasn’t actually in the game when I started playing, so I’ve only got a couple of days of experience with it. As you might have figured, the Auction House is for buying/selling/auctioning cards. Both gold (in-game currency) and platinum (the cash currency) can be used in the Auction House. That means you can sell cards you don’t want for platinum so that you can buy booster packs or other cash shop items.